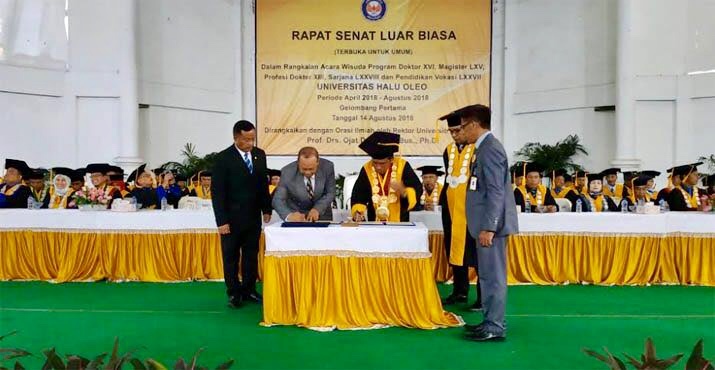 Indonesia Open University (UT) and University of Halu Oleo (UHO) Kendari agree to work together and sign a Memorandum of Understanding (MoU) for the improvement of enrollment index in higher education through distance learning and online education and human resources development (HRD). This MoU was signed by Indonesia Open University’s Rector, Prof. Ojat Darojat, M.Bus., Ph.D. and UHO’s Rector, Prof. Dr. Muhammad Zamrun S.Si., M.Si., M.Sc., in the middle of the graduation ceremony of UHO for April – August 2018 at Mokodompit Auditorium, Tuesday (14/8/2018). As a university with 34-year experience in Online Learning, UT is assigned by Ministry of Research, Technology and Higher Education (Kemenristekdikti) to disseminate sciences in higher education (PT) in Indonesia so that it has the capacity to implement online-based education. “The signing of the MoU is a commitment of UHO and Indonesia Open University to ensure the success of Minister of Research, Technology and Higher Education’s (Menristekdikti) programs and at the same time, to improve gross enrollment index (GEI) for higher education by Distance Learning (PJJ) and Online Learning,” said Prof. Ojat Darojat, M.Bus., Ph.D. Law Number 12 Year 2012 expressly establishes that distance learning education system may be performed by both single modus and multiple modus. Distance learning and online learning are no longer a monopolized market solely controlled by Indonesia Open University, and yet it will become the prioritized program of the Ministry of Research, Technology and Higher Education (Kemenristekdikti) which can be implemented in a number of classroom universities. The Rector of Indonesia Open University, Prof. Ojat Darojat, M.Bus., Ph.D. in his academic oration titled “University’s Roles in the Fourth Generation Industrial Revolution Era by the Integration of Technology in Learning Process”, said that with regard to the education issues, currently Indonesia is faced with the new era in line with the fourth industrial revolution which demands innovation and new breakthroughs in the education management. The learning process implementation which has been done in classrooms is deemed no longer adequate and it shall be shifted toward a more effective and efficient academic interaction. Subsequently, he also said that in the future, there is one important event that will be faced with our education which is the entrance of foreign universities in Indonesia as well as the birth of 400 universities that will provide distance learning education. As a consequence, our HR needs to be well prepared in order to cope with the imminent competition as mandated by our education vision. Whereas, the history of the economic development in many developed countries has proved that the thesis of human investment on the importance of HR quality in the development. Related to such new policy, then it is necessary to integrate the advancement that has been accomplished in information and communication technology in education implementation, including at UHO which has played a very strategic role so that they will become quality person and they are productive and capable of responding the constantly changing challenges in this era. With this cooperation, UHO will be able to improve HR not only in the Province of Southeast Sulawesi (Sultra) but also in other regions in Indonesia and Indonesia Open University is ready to become the UHO’s counterpart in implementing distance and online learning.